Newport News, Virginia Affordable Dentures & Implants offers several styles of full dentures, each with special features and advantages. It’s part of our mission to put transformation within reach. See below for more details, or call us at 757-932-3022 if you have a question about a particular style. 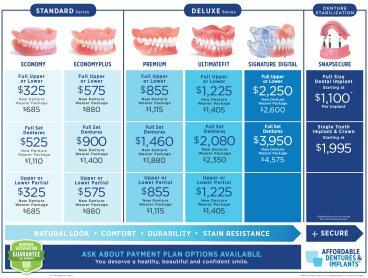 If you need an affordable dental implant to improve your smile and change your life, look no further than Affordable Dentures® in Newport News, VA. Our office proudly serves patients from Newport News, Seaford, Yorktown, Poquoson, Hampton, Gloucester Point, Williamsburg, Toano and surrounding communities. We provide a wide range of implant solutions, including single tooth implants and implant-supported snap-in and screw-retained dentures for either full arch or partial tooth restorations. Our Best Smile For One Low Set Fee. Guaranteed. A beautiful and confident smile has never been more within reach. The Affordable Implant Package includes our best denture, the UltimateFit, secured by implants, for one low fee of just $4,500. That's a fraction of the cost of most other providers. We are equipped with an on-site lab that produces dentures and prosthetics that will go on top of your new implants, which allows us to pass the savings directly onto you. Contact Affordable Dentures today and schedule an appointment with us to see if you’re a candidate for dental implants. Jamiah K. Dawson, DDS, MICOI, MAAIP is our local practice owner. She graduated from the University of Missouri-Kansas City School of Dentistry with a Doctorate in Dental Surgery. Since she graduated, Dr. Dawson has fabricated thousands of dentures with the help of the highly skilled technicians who work at her on-site dental lab. Please fill out the form below to request an appointment. For immediate assistance, please call us at 757-932-3022.